Pancake mixes have evolved from the basic combination of flour, sugar, salt and a leavening ingredient to sometimes include shortening and dried eggs. Since a conventional pie crust is made with flour, shortening and salt, with a few adjustments, a traditional-style pancake mix can be used to make the shell for your next lemon meringue or coconut cream. Pancake mix comes in two basic varieties -- original and complete. The original version contains fewer ingredients, namely flour, salt, sugar and baking soda. The complete style usually contains some type of shelf-stable shortening and dried eggs. Using the complete package to make pancakes, you only need to add water to the complete mix. With the original, you need to add shortening, eggs and water. Because most pie shells become too fluffy and soft with the addition of eggs, use the original mix to make pie crusts. When making a pie crust using pancake mix, measure the mix equal to the amount of flour called for in the recipe. Add the same amount of shortening and liquid as the recipe calls for but omit the salt, sugar and any leavening ingredients. In a food processor or mixing bowl, blend together until crumbly. 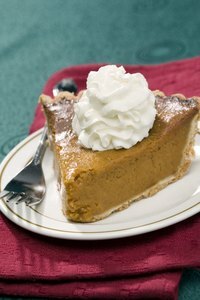 One of the secrets to great pie crusts may be in how the shortening is mixed into the dry ingredients. When mixed properly, the butter coats the flour to prevent it from attracting too much water. When the flour absorbs too much of the water, it forms gluten which makes the final product more tough. For flaky pie crust, mix the butter with the pancake mix until it forms crumbs. Large clumps of dough means it may be too wet or has not been incorporated enough, while a creamy paste means it has been over-mixed. After mixing, chill the dough for a minimum of 45 minutes before rolling. While pastry flour is recommended for the flakiest crusts because of its lower gluten content, most pancake mixes use higher-gluten all-purpose flour, which can make crusts made from a mix tougher than your standard crust. Also, pancake mixes may use more sugar than is called for when making a traditional pie crust, so the shell may be sweeter than usual, even without the addition of more sugar.